The Ontario Reign will join the fight against breast cancer with the biggest Pink in the Rink event in team history against the San Jose Barracuda at Citizens Business Bank Arena on February 5. Reign Pink Packs feature a ticket to the game with best available seating, exclusive 2016 Pink in the Rink t-shirt and donation to Susan G. Komen Inland Empire for as low as $30. 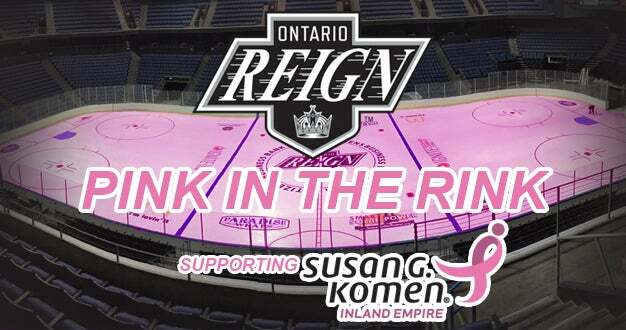 For the first time in Inland Empire history, the Citizens Business Bank Arena ice will be transformed into a frozen pond of pink and the Reign will wear pink jerseys and host a jersey auction. Fans can join the fight with an exclusive Reign Pink Pack with a portion of all the night’s proceeds benefiting Susan G. Komen Inland Empire. Since 1998, Susan G. Komen Inland Empire has awarded grants totaling more than $6.2 million dollars to local non-profit organizations in the Inland Empire to fund breast health education, diagnostic services and treatment support. In 2013-14, Komen Inland Empire invested $240,000.00 in local organizations for breast health education reaching more than 3,652 Inland Empire residents, provided 1,356 free and low-cost screening services, 727 diagnostic services and more.